We're staging a 2-day call-to-action to the community to come out and fill up our trucks with toys. After seven years of working together to put smiles on the faces of children in need throughout New Jersey, 1-800-GOT-JUNK? and Second Chance Toys are taking to the streets to increase awareness about their campaign in time for Earth Day. 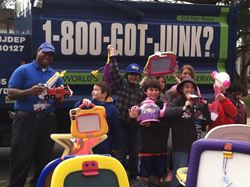 On April 12 and 13 1-800-GOT-JUNK?’s blue and green trucks will be parked throughout the Garden State ready to be filled up with gently-used toys from local residents. 1-800-GOT-JUNK? Franchise Partner Drew Trautman explains the current campaign. 1-800-GOT-JUNK? is spearheading the drive and Trautman hopes to collect in excess of seven truckloads of toys, the most they’ve ever collected in a 2-day period. Since inception, Second Chance Toys has collected a whopping 170K toys for children. April may be the very best time to achieve their goal. “The spring is the time most people are cleaning up the house and purging unwanted items. This toy drive also supports our Earth Day initiative to avoid dumping in the landfill, so it’s a win-win for everyone,” says Trautmann. 5 collection locations have been established throughout New Jersey where families will be encouraged to drop off toys that are plastic, in good shape, and with contain no missing parts. For more information on where to donate please visit http://www.secondchancetoys.com. Following the drive the toys will be cleaned and donated to children in need throughout the tri-state area. 1-800-GOT-JUNK? is pioneering an industry that is helping residents and businesses remove junk and regain space. Whether it’s a pile of household junk in the garage or a warehouse full of office furnishings, 1-800-GOT-JUNK? removes it for you, making the ordinary business of junk removal exceptional. We are passionate about recycling and donating to charity. 1-800-GOT-JUNK? was founded in 1989 and now operates throughout North America and Australia. For more information, visit http://www.1800gotjunk.com. Second Chance Toys was founded in 2006 by a N.J. high school student to recycle gently used plastic toys for children in need. To date, nearly 150,000 donated toys have helped keep our landfills free of these non-biodegradable plastics while bringing smiles and laughter to many children. This award-winning 501c3 non-profit has been recognized for the waste-need solution it provides to communities throughout the United States and Australia.